LAS VEGAS - Recovery teams using all-terrain vehicles prepared to trek up a rugged canyon near Lake Mead Thursday to retrieve five bodies from a remote site where a tour helicopter crashed during a sunset sightseeing flight over the Las Vegas Strip and Hoover Dam. National Transportation Safety Board investigators planned a morning briefing at McCarran International Airport about the Wednesday evening crash of the chopper operated by Sundance Helicopters in Las Vegas. The pilot and four tourists were killed. Authorities have released no information about the victim' identities; however, family members in Las Vegas identified the pilot as Landon Nield, 31. Nield was married in June in Las Vegas and was a pilot with Sundance for several years, his father, White Eagle Nield, told the Las Vegas Review-Journal. Company chief executive Larry Pietropaulo did not immediately respond Thursday to messages seeking comment. A company reservations agent said flight operations were suspended for the day. Morning television news video showed a charred crash site amid scrub brush in a canyon west of the edge of the Colorado River reservoir some 30 miles from the Las Vegas Strip. Witnesses told authorities late Wednesday that they heard the crash and saw smoke about four miles from the lake, National Park Service spokesman Andrew Munoz said. Munoz said a Las Vegas police search and rescue team reached the crash site in the River Mountains by helicopter and confirmed that all five people on board were dead. The site isn't accessible by road, which prompted officials to delay the recovery and investigation until Thursday morning. However, a park ranger rode in a four-wheel-drive truck to the crash site late Wednesday to protect the bodies and debris overnight, Munoz said. U.S. Sen. Harry Reid issued a statement mourning the deaths, praising the work of the park service and local police and fire agencies, and promising to monitor Federal Aviation Administration and NTSB investigations. "Hundreds of thousands of tourists enjoy these popular helicopter tours of Nevada each year," Reid said, "and I'm saddened that people lost their lives in this rare tragedy." A spokesman at Sundance Helicopters told The Associated Press on Wednesday that the helicopter had been giving a local tour when it suddenly disappeared. He didn't give his name and declined to answer further questions. Sundance Helicopters' website promotes only one local tour that flies over Lake Mead. The 30-minute "Twilight City Tour" spans downtown Las Vegas, the Hoover Dam and the Las Vegas Strip. Packages start at $210 per person. FAA spokesman Ian Gregor said the helicopter was an AS-350, which can hold up to six passengers and is often used for air tours. FAA records say the aircraft was built in 1989. It's unclear what might have triggered the crash. The weather was mostly clear near Lake Mead on Wednesday, with a low temperature around 29 and winds around 5 mph. Munoz said there were no notable conditions that might have caused the wreck. State records show Sundance Helicopters has been in business since 1985. The company offers daily tours to the Grand Canyon and its website boasts a 23-helicopter fleet serving more than 160,000 passengers annually. According to data from the Clark County Department of Aviation, Sundance flew 167,182 passengers during the first 10 months of this year  nearly 17,000 per month. It is one of four operators offering air tours from McCarran International Airport to nearby sites, including the Hoover Dam, Las Vegas Strip and Grand Canyon. The four carriers, which offer flights starting at more than $200 per person, flew just more than 469,000 passengers during the first 10 months this year. Sundance Helicopters has had previous accidents. A pilot and six passengers were killed in September 2003 when a helicopter slammed into a canyon wall while maneuvering through Descent Canyon, east of the Grand Canyon West Airport. In a 2007 letter that made safety recommendations to air tour operators and the FAA, the NTSB cited unsafe flying procedures and pilot misjudgment as the probable cause. The safety board said Sundance passengers and photographic and videotape evidence "indicated that it was not unusual for the accident pilot to fly the helicopter close to canyon walls and at bank angles, pitch attitudes and airspeeds." The company also received at least two written complaints from passengers previously about the pilot but did not discipline him. 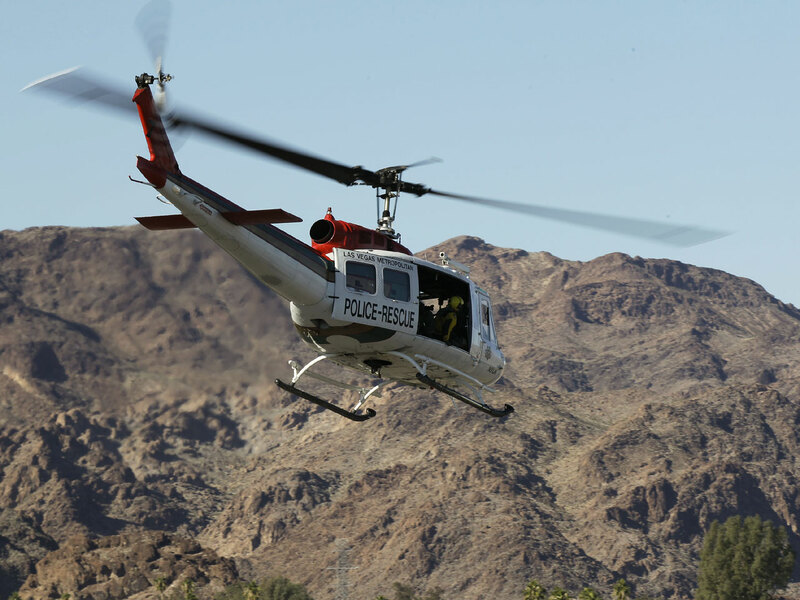 In August 2009, the pilot of a Sundance tour helicopter returning from the Grand Canyon with six passengers on board was forced to land in the Lake Mead National Recreation Area after the controls indicated an electrical problem. No one was injured. Sundance's website says, "All our helicopters are maintained with exacting precision and our pilots are trained then retrained with ongoing recertification in excess of FAA requirements."